While converting your typewriter into a teletype may not be all the rage, nor may it be all that … ‘new’ of a project, this one was sent in to me by Stefan (thanks!). This builds the single file for all 3 machine types of OS X..
For anyone that cares, this is my quad core box..
Ok, now let’s pull out the PowerPC executable, and run that…. Which isn’t too bad, seeing the emulator runs at 1/3rd speed of the native exe.. It’s no wonder that IBM bought transitive, and shut them down. This kind of technology would make it far too easy for everyone to move away from expensive CPUs…! Now let’s extract the 32bit i386 exe. Nothing to really see here. And for the final part, let’s combine the extracted PPC & i386 executables. And there we have it.. Using this I guess I can try to find versions of Qemu that will hopefully cross build on my machine that I can stitch together so that some platforms (PPC) have *SOMETHING* to run at least…..
Or maybe it’ll help someone at least make a stub ‘we are sorry, nothing to see here’ vs an exe error. I have only seen one NEC PC-98 in my life, and naturally it was in Japan.. Wiki has a great article, (naturally), basically it was an intel powered IBM incompatible system, that ran an adapted version of MS-DOS localized to Japanese. It wasn’t until the introduction of Windows 95, did these machines die out, as 95 could be localized pretty well..
Anyways, after googling around to see who linked my builds of Qemu, I found this site, by Takeda Toshiya that includes patches and binaries for PC-98 emulation via Qemu! 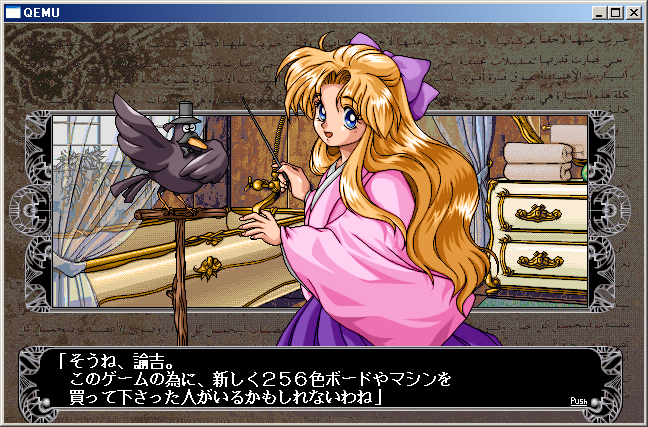 I understand the PC-98 had quite a following for all kinds of games as people shifted away from the Sharp X68000.. Who also announced last week that they would exit the PC market all together. Another thing to ‘fix’ in addition to the 0.13.0rc1 is this..
And the whole package is here, which includes the i386/x64 support. Let me stress for those of you clicking like wild that if you are just emulating a typical pc you only need the much smaller download… As for the rest, well you know the deal. I’ve also built this out on my mac, but it’s x86_64, so you 32bit people would be out of luck.. I’m not sure if I could do a multiple arch build in one shot, or use lipo to just glue them together??? Anyways, I’ve tested Solaris 2.6 (SPARC) and NT 4.0 (MIPS) so I imagine everything else is ok…. As always, you can download the source here. Author neozeedPosted on October 19, 2010 Categories qemu4 Comments on Qemu 0.13.0 released! CP/M & Zork in Java Script!!! This morning, I got an email from Stefan Tramm, informing me of his work.. Basically he’s combined ShellInABox’s vt100 commands, js8080’s Intel 8080 emulator, along with z80pack’s disk format, and CP/M port to provide a CP/M emulator that works in Java Script!!! Now the emulator is one of these new fancy HTML5 applications, which means you’ll need either Google Chrome 5, or Safari 5.. I would imagine Internet Explorer 9 and a later Firefox ought to work…. One thing that you’ll want to do is configure your popup blocker to allow the domain tramm.li to open up popup windows, as that is how you mount disk images into the VM..
To get going though it’s real simple. 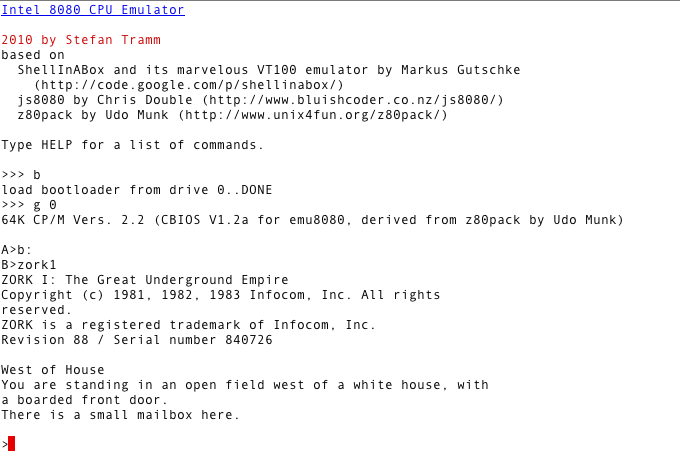 Just click http://www.tramm.li/i8080/ and hit the “Start Emu8080” link, and you’ll get to the console. All running in a browser! So taking it one step further, I downloaded and built the Cpmtools 2.13 on OS X, used the cpma.cpm disk image as a template, deleted it’s contents and then inserted the ZORK 1 data & program into the disk image… Giving you a zork1.cpm. So if you’ve turned off the popup blocker on Chrome, you can type in the ‘dsk’ command before you boot up CP/M. This way you can load it into the disk 1 position (B:) then boot up CP/M and play…. And thanks to Stefan for emailing me about this! And that’ll place Zork 1 into the ‘B:’ drive. So a few years back, my laptop died, and I was on the road. I swung into a Wal*Mart, and picked up an Acer One for under $300 USD… Nice machine, but it’s loaded up with Windows XP home. Which is ok, for being in a panic and on the road, but wasn’t all that hot for a full time laptop. So fastforward, and I’m looking for a machine to run some low level ASP.NET stuff on, and while looking through my old machines, I’m thinking if only this Acer One could run 2003, or even XP Pro. But I don’t have a USB CD-ROM on me, and I’d like to format the drive, obliterating all the bs I had on there before. That’s when I came across this great program, Win Setup from USB. What a lifesaver, a minute downloading 2003 from MSDN, and a spare 2GB flash drive, and I’m installing 2003 on my Acer One. Not to mention I can load Virtual Server 2005 (not the r2 version or the service packed one, that’ll load nextstep!). Oh well that’s my random thing for the day. Qemu version 0.13rc1 has now been released! At any rate, I’ll provide binaries for Windows users, a x86 only package is here, while the larger ‘full’ package is here. This applies to Qemu and real SPARC’s… Anyways, every disk that Solaris uses has to be tagged with a special ‘format’ and disk label for use. When you buy disks from SUN they did this at the factory. However if you go ahead with a 3rd party disk, you’ll have to do this yourself. Luckily it’s not all that hard. Now I’ve had issues with Solaris 2.6’s format program so I also use a Solaris 8 CD for that portion. I’m going to assume you’ve got all the bits to make Solaris on Qemu work. The first step is to create the hard disk. I’m running this on OS X, however the steps are all the same for Linux & Windows users. Now the next step is to fire up Qemu with the Solaris 8 CDROM. Setting NVRAM parameters to default values. Keyboard not present. Using tty for input and output. ROM Rev. 2.15, 256 MB memory installed, Serial #0.  Ethernet address 52:54:0:12:34:56, Host ID: 80000000. Now the kernel will boot up, and dump us into single user mode. Take note about the disk having a “corrupt label – wrong magic number’ error. Copyright 1983-2001 Sun Microsystems, Inc. All rights reserved. NOTICE: SBus clock frequency out of range. Using RPC Bootparams for network configuration information. I now issue the drvconfig/disks commands. This is more useful for adding disks to a live system..
As a note the format program likes to reserve the last 2 cylinders, so you must answer this appropriately. Finally we just slap down a label and we should be good to go. I run the command twice to make sure that it took, as it should only mention the corrupt number one more time, then it’ll be ok.
Now we can quit, and reboot the VM.